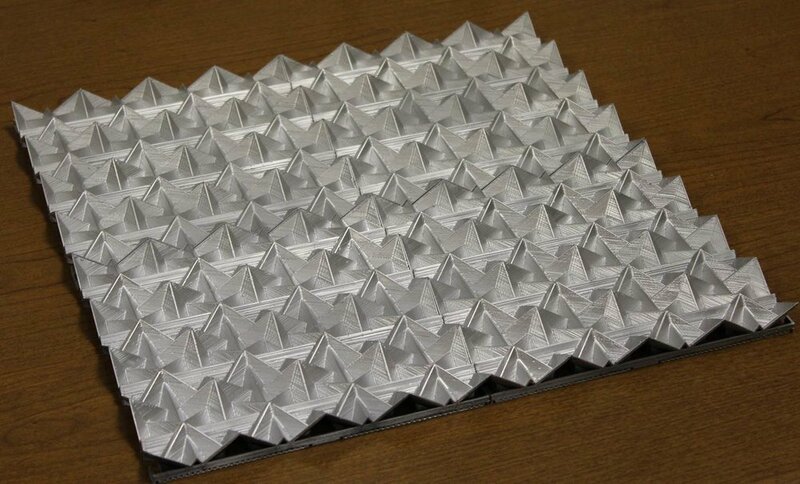 Tailorable truncated retroreflector array (TTRA) technology can be used to design 3D architectural tiles, which can be made entirely of plastic, where the reflective surfaces of the 3D architectural tiles provide a unique and beautiful glow that changes with the source or sources of light encountering the surfaces and the location of the viewer relative to the surfaces. When the source of light produces moving light patterns such as can be produced by a theatrical lighting system, the reflective surface seemingly comes alive as the light moves through the retroreflecting and light-redirecting portions of the surface. 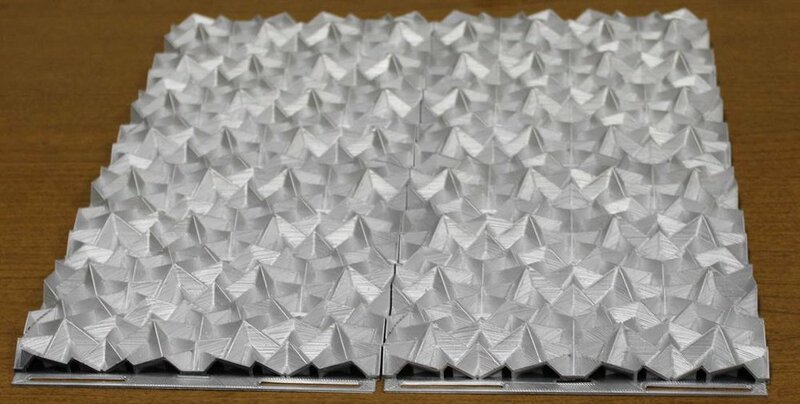 Figures 1-5 present prototype 3D architectural tiles that were manufactured using a deposition 3D printer and spray painted with metallic paint. Figure 1 depicts two prototype architectural tiles created using an equilateral triangle truncating object with a 60° truncation rotation. At the left of each tile are various slots used for attaching the tiles to a wall and for interlocking tiles. Figure 2 depicts a 4 x 6 array of 3D architectural tiles like those shown in Figure 1. Figure 3 depicts 4 x 2 array of 3D architectural tiles created using an equilateral triangle truncating object with a 30° truncation rotation. Figure 4 depicts a 2 x 2 array of architectural tiles created using a right isosceles triangle truncating object with a 15° truncation rotation. Figure 5 depicts a 2 x 2 array of architectural tiles created using an isosceles triangle truncating object with a 45° non-congruent angle and a 15° truncation rotation. Figures 6 and 7 depict various examples of the difference between theatrical lighting shining on a wall versus 3D architectural tile.